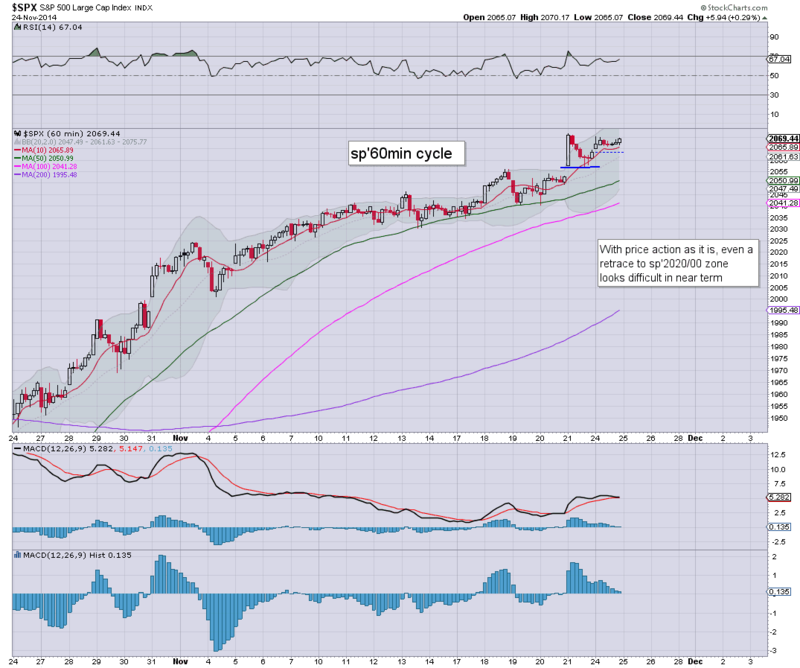 US equities climbed a little higher, sp +5.9pts @ 2069. The two leaders - Trans/R2K, settled higher by 0.8% and 1.2% respectively. 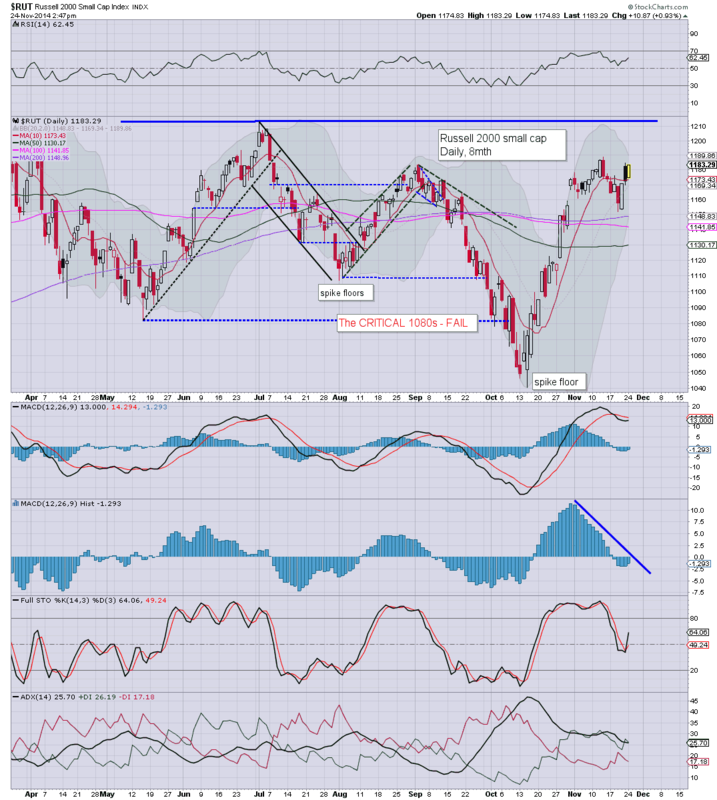 Near term outlook is for continued subdued price action.. inclined to the upside. 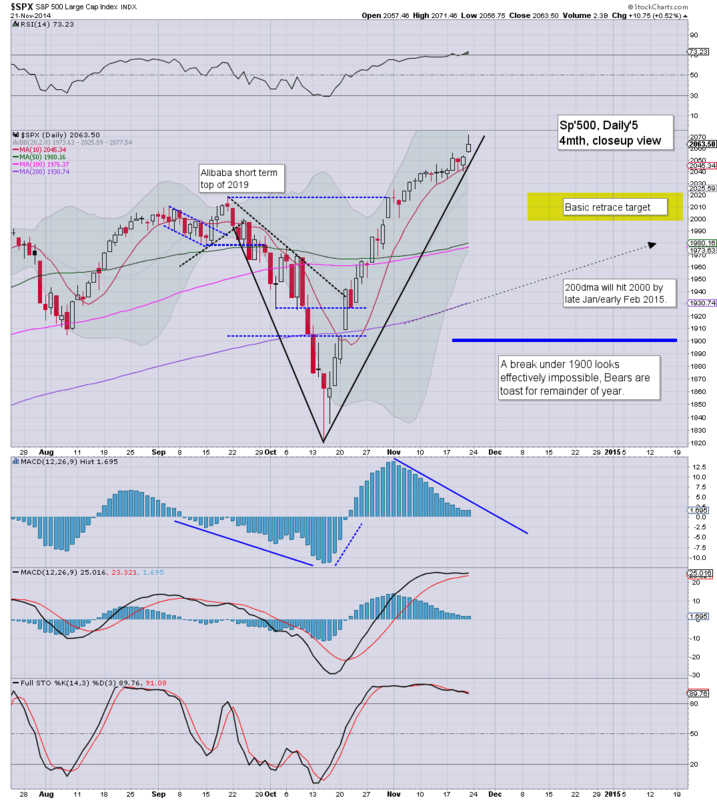 Sp'2100s remain viable.. before the next retrace. 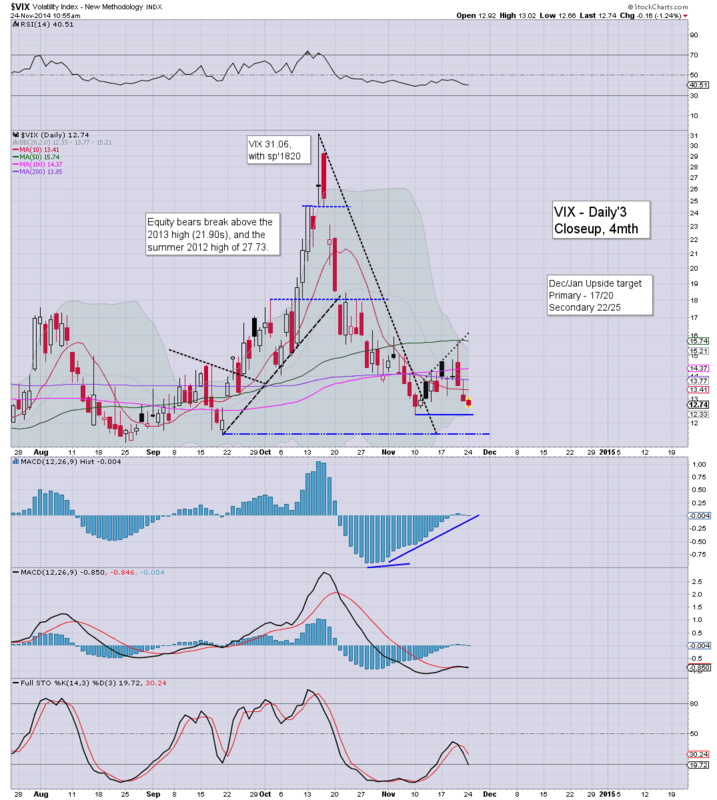 *VIX remains reflective of a market with near zero fear, but more on that later. A very quiet day.. but then.. its a holiday week. There is little reason to believe that Tuesday won't be quieter. Whilst the broader market is only a little higher, there is notable strength in the second market leader - the R2K, +1.0% in the 1180s. A monthly close >1220 - likely in Dec or Jan', will bode for massively higher levels across 2015. 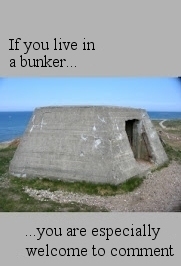 Bears.... beware. The double top of 1212/13 is set to be broken... more likely in January than December, but regardless.. once the R2K is in the 1220s it should be considered a hugely bullish signal for the broader market next year. Notable weakness, oil/gas drillers, SDRL -3% @ $20.60s... set for 12/10.. worse case in first half of 2015. US equity indexes remain in a starkly bullish posture, with the sixth consecutive green candle on the weekly 'rainbow' chart. There is little reason why the sp'2100s won't be hit before year end. Without question.. this is no market for index shorts. Suffice to say, general price action is quiet, and things will surely get even quieter as we approach Thanksgiving. No doubt, retail stocks will be of greater interest once the initial sales reports start appearing late Thursday/early Friday. Time for the dumb sheep to rack up more credit card debt, buying more junk they don't need. Yeah.. that IS the spirit of Thanksgiving. yours... still here.. and not going anywhere. 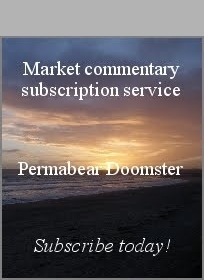 The US equity market is naturally quiet.. in what is a short 3.5 day trading week. There is little reason why we won't see the sp'2080s... along with VIX 11s. Metals are weak, Gold -$6, whilst Oil has turned fractionally higher, +0.1%. Little to add... on what is a quiet day. Notable strength: INTC +2.1%... massive underlying strength. US equities remain moderately higher, and there is little reason why the bulls can't claw generally higher across this shortened 3.5 day trading week. Energy remains weak, Nat' gas -3.1%, whilst Oil has turned fractionally higher, +0.1%. VIX remains in classic melt mode.. and it does not bode well for anyone seeking even a minor retrace to the giant sp'2000 threshold. Notable strength, INTC, +1.5% @ $36s... headed for the 50s...(given 6-12mths). 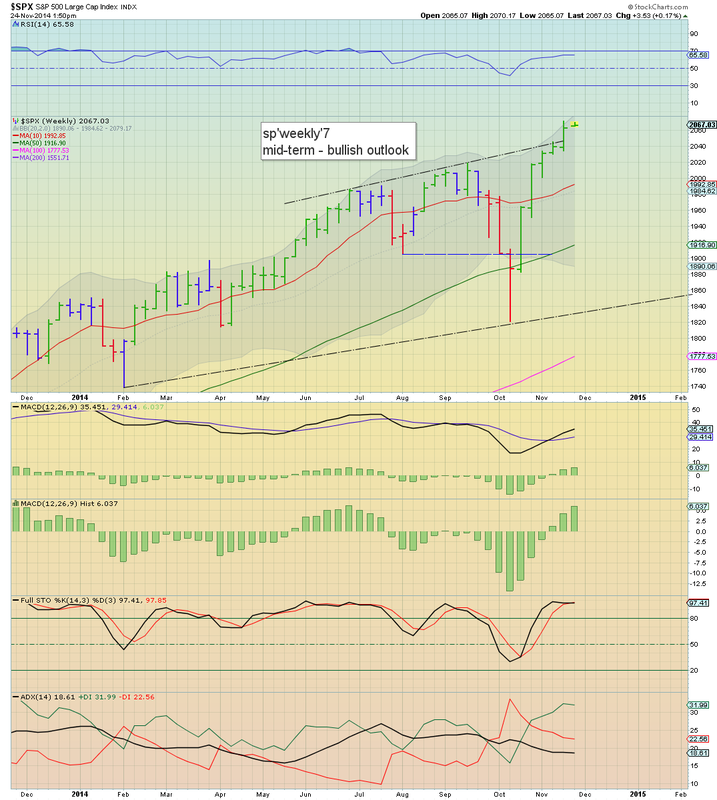 US equities open moderately higher, but it is more than enough to break a new historic high in the Trans of 9177. Incredibly, that makes for a gain of 19.2% across 29 trading days. At this rate.. 10k before year end. 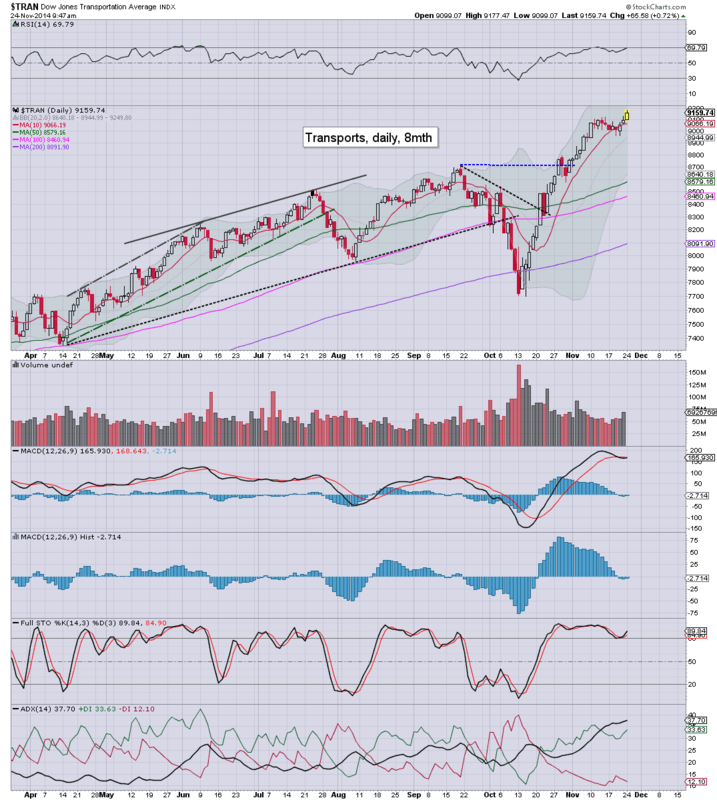 Trans 10k is an easy target, and if you can accept that.. then you will be resigned to sp'2150/2200 in Q1 of 2015. Nat' gas -3.6%.. with Oil -0.8%. At best.. equity bears might get a retrace back to the sp'2000 threshold... but even that might not happen until the the low 2100s are first hit. *with weak Oil.. airlines are on the rise, DAL/UAL both higher by 1% or so. 10.25am.. VIX is in classic melt mode... -1.3.% in the 12.70s. There seems little reason why that won't persist across the entire week. Good morning. Futures are moderetely higher, sp +6pts, we're set to open at 2069. Metals are a touch weak, Gold -$3, whilst Oil is -0.6%. 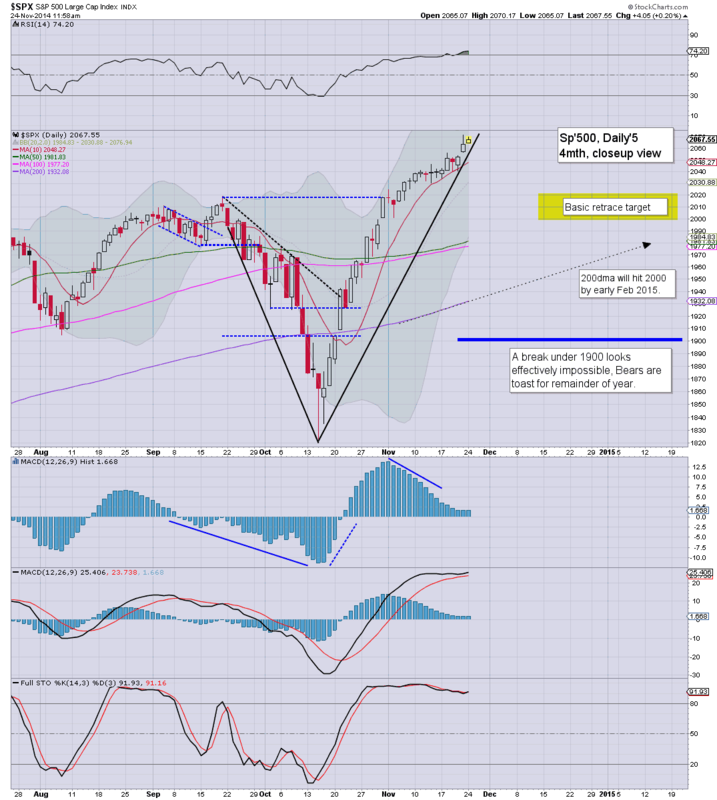 The sp'2100s remain a real threat in the near term. Well, its a short holiday week.. lower volume, and that will surely favour the equity bulls.